FAMILY political battles put Sean O’Reilly in good stead for contesting the City of Greater Dandenong mayoral position. 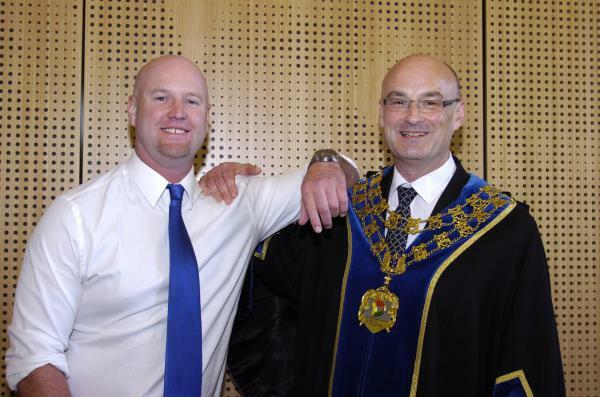 His brother Michael was also successful at the 2012 local government election, winning a City of Frankston seat. Michael said he and his older brother spoke about council “a fair bit”. “Dandenong and Frankston have very similar demographics so what we find is we have the same sorts of challenges,” he said. “I’m a Liberal Party member and he’s been a Labor as you can get since he was a kid. But their mum Barbara is always there to break it up. “They’re both reasonable in their arguments as well, which is important,” she said. Their dad John said he was “very proud” of Sean. “He’s such a dedicated worker. Everything he does he goes in really hard,” he said. He’s confident he’ll still see plenty of him during the busy 12 months ahead – at least on his way out the door. “He’ll still need a babysitter,” he laughed. Cr O’Reilly said council colleagues had seen his potential and that he would benefit from a year as mayor. “I’m intending to be on council for the long term,” he said. He will take a year off from his role as an information technology professional for Kmart’s national head office to focus on the role. Like his dad, Cr O’Reilly wasn’t worried about warnings from several councillors that he wouldn’t see his family – wife Hien and children Claudia, 12, and John, 3 – during his mayoral term. “It’s through the family that I get a lot of sustenance,” he said. “I certainly heed the warnings of past mayors. They’re really saying don’t let the job consume you. He’s looking forward to overseeing the Springvale Gateway project’s completion, starting the Ross Reserve redevelopment and advocating for the Lyndhurst Landfill’s closure. Cr Memeti said he saw significant progress on several projects during his term, the biggest being the Dandenong Civic Centre. “It is my sincere hope that now, at the end of my term as mayor, I have served the citizens of Greater Dandenong well,” he said. He told Cr O’Reilly that he loved his enthusiasm. “I think you’ll do a great job as mayor,” he said. Great that Mr. O”Reilly became Mayor the other night. To the best of my knowledge he has three children, not two as reported. Hi Bronwyn, thanks for your comment. We interviewed Cr O’Reilly following the election and asked who his immediate family consisted of and he indicated just the two children. Sorry for the confusion. I have 3 children in total, the 2 youngest live with my wife and I at home. My oldest daughter is married and lives with her husband.